This thread will provide an ongoing collection of EDN "Design Ideas" and Electronic Design "Ideas for Design" articles that I've clipped over the years. The first installment was filed with some Jim Williams articles because they shared a page. The collection of Schmitt input gates wired as monostables is a nice collection similar to Don Lancaster's "CMOS Cookbook." I liked the article enough to have scanned it and posted it on the server but never linked to it. "Configurable Logic Gates' Schmitt Inputs Make Versatile Monostables," Glen Chenier, EDN May 25, 2006. "Configurable Logic Gates' Schmitt Inputs Make Versatile Monostables," Glenn Chenier, EDN May 25, 2006. While the above makes use of the NC7SZ57 and NC7SZ58 configurable gates, the functions can be easily duplicated with metal gate CMOS and, when inversion is required, an additional CMOS gate. Even without the RC a variant of the simple gate delay was sometimes used to get timing circuits working. Back before microprocessors came with flash and ram memory onboard, communicating between separate ICs required a delicate trapeze act to get all the timing correct. Sometimes an enable line had to be set up before the clock edge rises (or falls). The set up time could be only picoSeconds. Running a digital strobe through a non-inverting gate, or two inverting gates could generate just enough propagation delay for the circuit to read and work. I have one painful memory of having to make a digital prototype at Peavey work (smpte time code to machine control). The hardware and software was designed by an outside consultant but the buck stopped with me since I was over the program inside Peavey. I even carried the prototype over to the digital group and begged the real digital engineers to help me... After a few hours they gave up and sent me packing without a fix. I finally figured it out myself, after way too much pain. In life what doesn't kill us makes us stronger but i really hated getting digital prototypes to boot up and run that first time. "Consider The Deboo Integrator For Unipolar Noninverting Designs," Elliot Simons, Maxim Integrated Products, Electronic Design, March 18, 2002. The non-inverting Deboo integrator has a passive input pole which is important for audio servos. 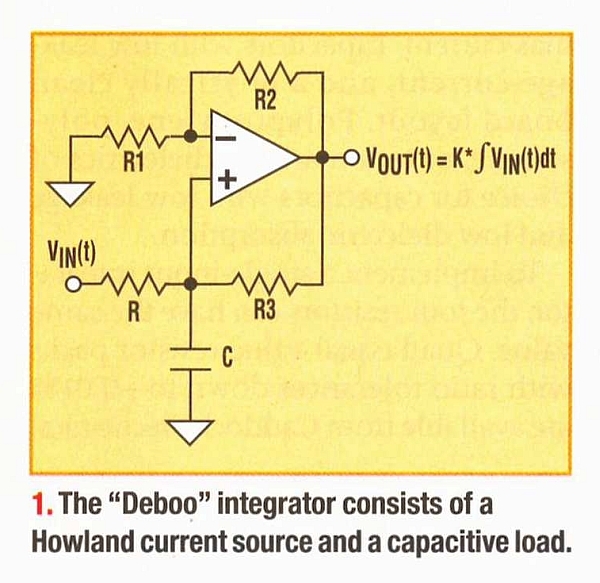 Other advantages of the Deboo Integrator are its non-inverting single capacitor topology. "Beeper Finds Circuit Shorts," Jim Wood, Inovonics, Electronic Design, March 20, 1995. "Beeper Finds Circuit Shorts," Jim Wood, Inovonics, Electronic Design ,March 20, 1995. 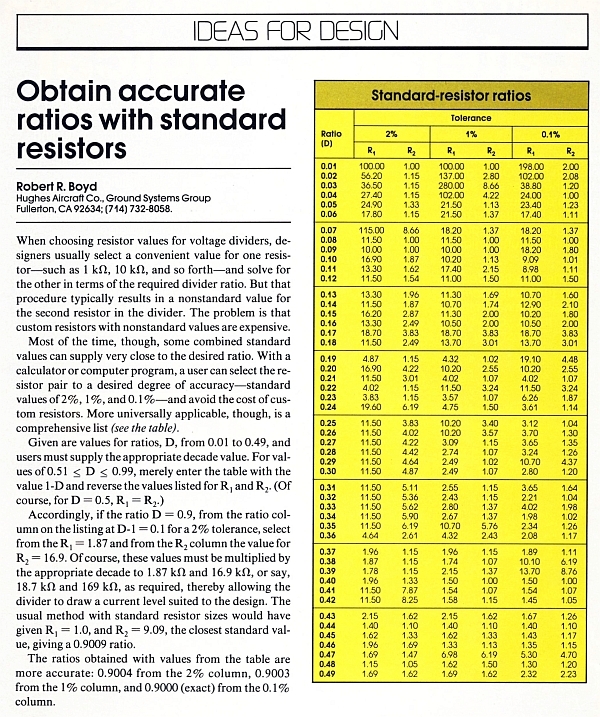 "Obtain Accurate Ratios With Standard Resistors"
"Obtain Accurate Ratios With Standard Resistors," Robert Boyd, Electronic Design May 12, 1988. 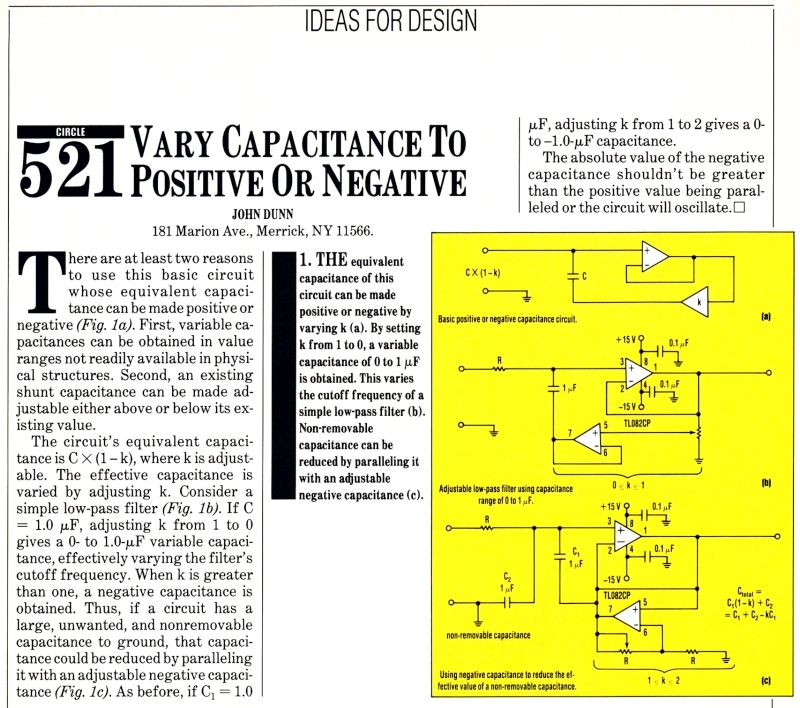 "Vary Capacitance To Positive Or Negative," John Dunn, Electronic Design, December 5, 1991. This circuit looks similar in function to one JR showed us to provide variable attack/release. There looks to be an error in figure (c) with the output at pin 7 tied back into the follower. mediatechnology wrote: "Vary Capacitance To Positive Or Negative," John Dunn, Electronic Design, December 5, 1991. Capacitance multipliers are known to designers. In fact back in the '70s I did a variant on the filter in schematic b) but flipped around as an adaptive HPF for use with my tape NR kit. 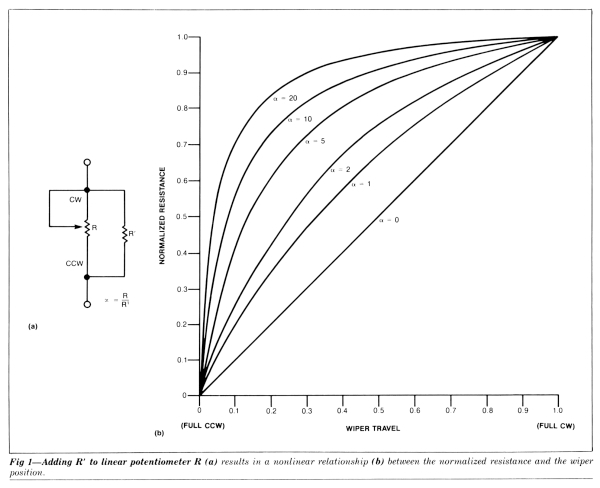 Reverse the C and R. Inverting voltage gain in the R path shifts the effective R smaller, so makes HPF pole frequency higher. I had a problem with companding the output from playing records with too much very LF content (like not centered record holes, or warped records). The compander's compressor stage would happily compress the extra rogue LF content but the tape recorder would scrape off that extra very LF content. Upon playback the expander was not getting the same full signal envelope to establish accurate playback gain tracking. The missing LF content would cause a phantom modulation to the rest of the remaining audio signal. My fix was an added input cap at the very input to the compressor stage (which was inverting overall), with a resistor from the inverted compressor output. As the compressor gain varied with signal (higher gain at low signal level, lower gain for high signal levels) the pole created by the RC shifted from full LF response at high levels, to significant LF cut at low levels (when the compressor gain was max). This effectively reduced the impact of rogue LF content on low level signal passages while still delivering wideband response for high signal levels. With high level signals the envelope was dominated by real music so the lost LF content from the tape response didn't cause audible artifacts. In an ideal world I would have buffered the input cap, but as a simple add-on tweak to an existing kit design, this one cap one resistor fix worked wonderfully. Yes, there are a lot of examples. A lot of design ideas are (or were) circuits which have been published previously but lost or "rediscovered" by each new generation of engineers. 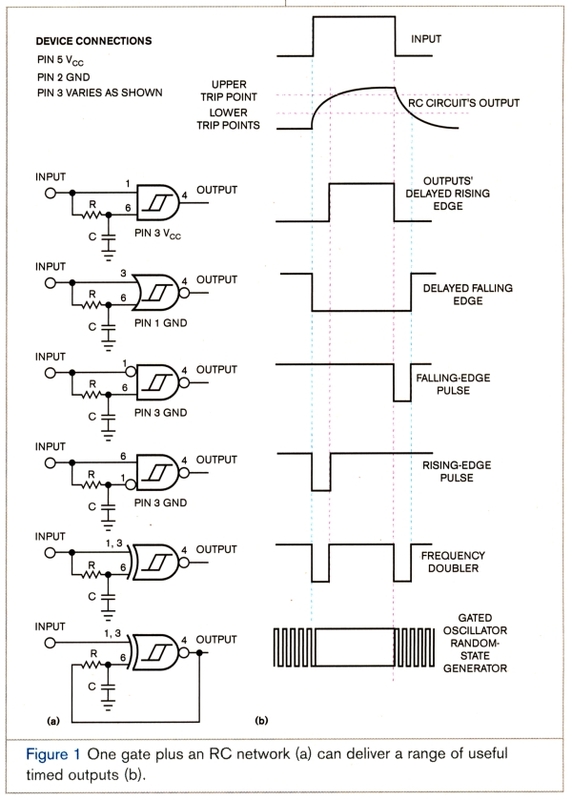 The bootstrap op amp articles are one that keeps re-appearing every few years. Another thing to keep in mind with many of the Design Ideas are that they solve very specific problems and aren't necessarily being used in mass-produced products. Sometime the quickest way to achieve a result might not be to use the least-expensive or use the fewest parts but the project winds up costing less due to the time savings. Test and measurement gizmos are one that immediately come to mind. Sometimes you only need to produce one. One guy's solution to a very unique one-of-a-kind problem may give another guy an idea in a totally unrelated field. A third problem are that the original publications no longer have these archived. If they do, they often lack the figures and are worthless. I'm posting this stuff because a lot of these articles are simply being lost. That's very clever. Makes me think about ways to make a program-dependent HPF for a compressor sidechain. Yes, putting the cap in series with the side chain input with the resistor still to the compressor (inverted output) will dynamically roll off LF only at low amplitude, actually only at high rates of compression if that is adjustable. This might help discriminate against low level LF air conditioner vent noise in a quiet studio. I did a more complicated variant of that (RC with gain in one leg or the other) to make a variable LPF for a single ended NR I designed at Peavey. Input R with cap to the inverted output of a VCA stage... this was one part of a single ended NR that also performed downward expansion... Like the popular dynafex but mine was subtractive, so transient recovery from full off, was instant. Most variable LPF or downward expanders take time to open up. But Peavey (AMR) was not the brand to support premium studio products, so it went unnoticed like so many of my products there. 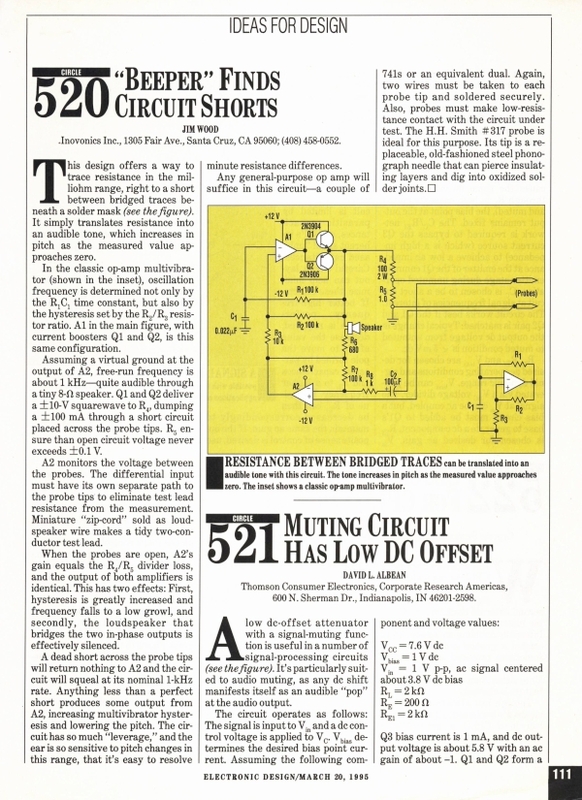 "Resistors Provide Nonlinear Pot Tapers," Mark Rumreich EDN November 13 1986.